selling 10;000 copies per issue. 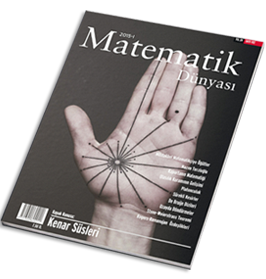 The magazine is designed to encourage students of all ages to pursue activities and careers in mathematical sciences. Successive issues are dedicated to specific subjects covering contemporary advancements in mathematics. ‘World of Mathematics’ has been on market since 1991. Books are available at our center in Karaköy/İstanbul. Please contact us at tmd@tmd.org.tr for your cash on delivery copy or call 0212 292 49 39 for more information.